Many tenants wonder if they should have renters insurance… I would never rent a home or allow my kids to rent a home without it! There are many reasons why you should have renters insurance but only one reason to not have it… cost! If you have never take the time to price a renters insurance policy you will probably discover the cost is much less than you thought. In my experience the cost of a plan offering around $30,000 for coverage of personal belongings and $100,000 liability coverage would cost no more than about $25 per month. If you live in a house with a pool you should really consider a policy with $1,000,000 liability coverage which surprisingly isn’t that much higher priced. Many tenants don’t realize that the homeowners insurance policy held by the owner of the property, in most cases, does not have any coverage for their personal property. Should there be a flood, or even worse, a fire, you could find yourself with no possessions and in most cases, no recourse. A tenant could have liability if someone is injured on the property. Imagine if you had friends helping you move into your new rental home and one of them is injured in the process, you could have a liability issue. There are thousands of reasons that a tenant could have liability, it isn’t limited to property owners. Your negligence, intentional or not, could cause a liability issue with the owner. A faulty power strip for your computer could spark and cause a fire. Your washing machine could flood while you aren’t at home. You notice a small roof leak but forget to call it in until the next big rain that causes severe ceiling damage. All of these examples could lead to damage to your personal property and open you up liability issues with the owner and their insurance company. The list of reasons you should have renters insurance is endless and like all insurance, you will sure wish you had it when the wrong situation arises! A great place to start looking is your current insurance company. If you aren’t already receiving a multiple policy discount you could get a huge break on the already cheap cost. With the temperatures dropping below freezing it’s important to protect exposed pipes from freezing and rupturing. One simple method to keep the water inside the pipe from freezing is to leave a faucet trickling overnight from the faucet located highest in the house. The trickle should be a steady stream, about the size of the lead in a pencil. If your exposed pipes are not wrapped and insulated you should talk to your landlord about having it done. The insulation does deteriorate over the period of a couple of years so your landlord may not be aware that the pipes have become exposed. It is also a good idea to locate the main water shut-off valve. If you need help locating the valve please contact your landlord. Let’s not forget the trash cans! After my last post regarding weeds, I received two HOA violation letters regarding tenants who had not moved the trash cans out of the view from the street. Most HOA’s have rules about the storage of your trash cans, and usually that means in the backyard or in the garage. In addition, HOA’s have rules about how soon you can place garage cans on the street and how long you can leave them out after the trash has been picked up. Collection times vary. 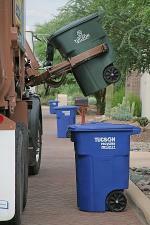 To ensure service, set out your containers by 6 a.m. on collection day. Set containers at the curb with the lids opening toward the street. Please leave at least three feet between containers. Place the containers three feet away from parked cars, mailboxes and other obstacles. Allow 15 feet clearance from tree branches, utility wires, etc. above the container. Do not leave your containers at the curb on non-service days. Containers must be pulled back onto private property on non-service days. Check with your trash provider to see if they have different rules. With the Monsoon rains coming soon, weeds won’t be far behind. If you live or have rental property in a Homeowners Association you need to stay on top of the weeds or you can expect a violation letter from the HOA Management. It seems like HOA’s are cracking down on these types of violations. Make sure you tenants are aware of the issue and hopefully you can stay ahead of the problem.